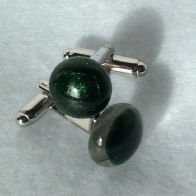 Cufflinks are on silver plate or gold plate backs. If you would like to have his and hers earrings and matching cufflinks please go to the contacts page to express your interest. I will be happy to discuss your idea.